Let's talk about the outfit details for a second! So in one of last week's blog posts- I shared an outfit from my favorite online discount retailer Shein that was actually kind of a miss for me (a "get what you pay for" in terms of quality situation). The shorts I'm wearing in today's post also from Shein.... but WOW! These are a win!! They are only $10, and fit well and are really cute. As with most things from Shein, I did size up in them! 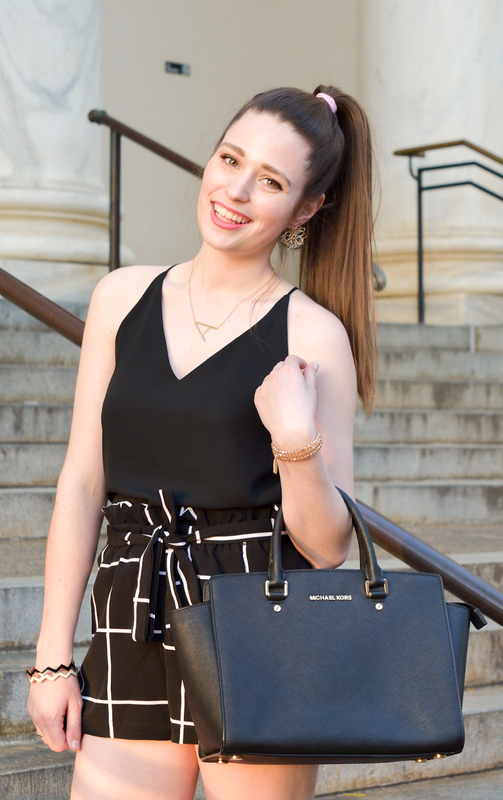 Usually in the summer months I wear even brighter and colorful outfits than I normally do, but this outfit is all black and neutrals and I still really liked it. Now let's talk about happy places! We all have them. You know what I'm talking about- a place that you can arrive at and instantly feel at peace, or at least able to forget a bit about the distractions and stress of everyday life. I'd love to share a few of mine with you, and please let me know in the comments what yours are! *Library: Probably a given from these photos! I've loved libraries and reading since I was a little girl. There's not a lot of things that are truly free to enjoy in the adult world, but public libraries are a rare gem! I am such a big bookworm, so letting myself get lost in a place that's completely dedicated to the love of reading and books is something I'm always down for! I've had a local library card in every city/state that I've lived in- it's usually my motivation to go to the DMV for my new license when I move, because new license equals being able to get a library card! *Mall: Okay- it's no surprise that I love fashion since I have a fashion blog! However, one thing that I've noticed from a lot of girls' blogs that I read is that a lot of bloggers admit to preferring shopping online! While there are some online-only retailers that I do like shopping at, I still love the retail experience and going to the mall. Maybe it's part childhood nostalgia (I have the best memories of looking forward to mall trips for my birthdays or other special occasions growing up! ), or part the fact that I did work in retail for a bit myself, but malls will always have a special place in my heart. There's just something about the smell of cinnamon buns wafting from the food court- you know what I mean! Even if I'm not going to the mall to buy anything specific, if I have a few hours to kill and want to get out of my apartment, it can be a nice place to walk around, especially in winter when the weather isn't great. *Beach (especially in my hometown): Okay- cliche answer here! Who doesn't like the beach, right? But it holds a special place in my heart as a happy place, since I'm from a small coastal town in Maine! Now that I live in a landlocked place, my heart misses the ocean where I'm from, especially in the summer months! Maine beaches are very natural and serene, most of them aren't built up or commercialized. I don't get homesick very much as I really do love the South, but sometimes I do long to take a long walk on one of my hometown beaches! I definitely appreciate it a lot more when I get to visit home now, as visits are few and far between. *Radio studio: I feel so lucky to be working in my dream industry, one that I dreamed of being in since I was a little girl! Being in my station's studio, where I spend the majority of my workday, really is a happy place for me. Some days I have to take a minute and just reflect about how lucky I am to be able to play great music, and bring joy to people's day in their cars or workplace (or wherever they listen to the radio!) - like that's my actual job! *Airport: Okay- this one needs a little explaining. Airports definitely stop becoming a happy place when severe flight delays are involved. But if everything goes smoothly on the travel end, I love airports! I feel like there's so much excitement in the air to see everyone hustling and bustling around, off to different destinations. And I think airport gift shops are so fun- I've found some of my favorite touristy souvenirs in them! *Church: There's just something so sweet and special about coming together to worship God and hear a great biblical message with other believers! This goes beyond just traditional Sunday services though. Church being my happy place includes bible study meetings, service opportunities, or just general times of fellowship with my church family! Okay- those are my favorite happy places! What are yours? Hope your week is off to a good start!! Ooh love this post! Waterfalls and beaches are definitely both happy places for me and so are coffee shops! I just feel so happy and productive in them. I love shopping in person too! I think I get a better sense of fit when I try things on. That said, I haven't been to a mall in YEARS! I hear that a lot of malls across the country are closing. Libraries have to be my happy place - libraries and book stores! Also, on a sartorial note, I love those shorts! I stopped buying things from those Chinese wholesale sites, just because I'm trying to be more mindful of my shopping habits but those shorts have me tempted! I love that you shot your outfits posts in a library, so creative!! I haven't been to the library in so long! I definitely should though - it'd save me a ton of money on books! The bookstore is definitely one of my happy places haha. I love to read. This outfit is super cute too! What a fun place!!! Libraries are awesome :) Love your outfit. When living in VA, one of my happy places was the Blueridge Parkway - so many great trails!!! I actually love airports also! It's so interesting to people watch there. I love your shorts girl! I have never shot at the library before but now I'm thinking about how cool that would be! Those shorts are so cute! The beach is my very favorite spot too! Those shorts are adorable! My happy place is definitely a small coffee shop. But I also love the library too. Anywhere traveling is my happy place! Girl! Those shorts are amazing! What a steal! Preppy 4th of July Outfit. 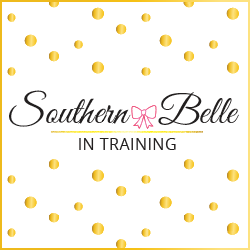 Southern Belle Garden Party Outfit. National Wear Your Lilly Day 2018. My Summer 2018 Bucket List!